Dr. Benjamin Boren ,an American pianist and pedagogue currently living in Burlingame, California. Petrof P173 Breeze Klasik As a pianist who has played mostly pianos owned by the universities I’ve attended and at which I’ve taught and performed, I’ve rarely had the opportunity to try out instruments by makers other than Baldwin, Bösendorfer, Mason & Hamlin, Steinway, and Yamaha. I had heard of the Petrof brand, but had neither seen nor played one before. With the help of Joe Brattesani of World Class Pianos, in the San Francisco peninsula city of Burlingame, California, I was able, for this review, to sample three recently upgraded models: the Bora (5′ 2″), the Breeze (5′ 6″), and the Storm (6′ 2″). Even before playing, I noticed the pianos’ aesthetic appeal; they are beautifully constructed, and feature eye-catching wood veneer around the inner rim. This particular Breeze had the “Klasik” (Classic) upgrade, which includes a filigree music desk and tapered, “ice-cream cone” legs, both tastefully elegant without being too ornate. These pianos also display, on the right keyblock, the European Excellence crest, an attractive feature that declares the instruments’ solely European construction and use of at least 61% European-made parts and materials. To test the pianos, I played repertoire from a recent recital: Mozart’s Adagio in B Minor; Beethoven’s Variations in C-Minor, WoO 80; the complete Chopin Préludes; and Carl Vine’s Sonata No. 1. To test how the pianos reacted to specific situations and textures, I also played excerpts from Debussy’s Clair de Lune, Liszt’s Sonata in B-Minor, Prokofiev’s Piano Concerto No. 3, and various preludes and fugues by J.S. Bach, among other pieces. Certain capabilities, such as repeated notes, were tested separately from pieces. Generally, the instruments behaved similarly in almost every aspect, with the characteristics, as expected, becoming more pronounced and enhanced with each increase in size. 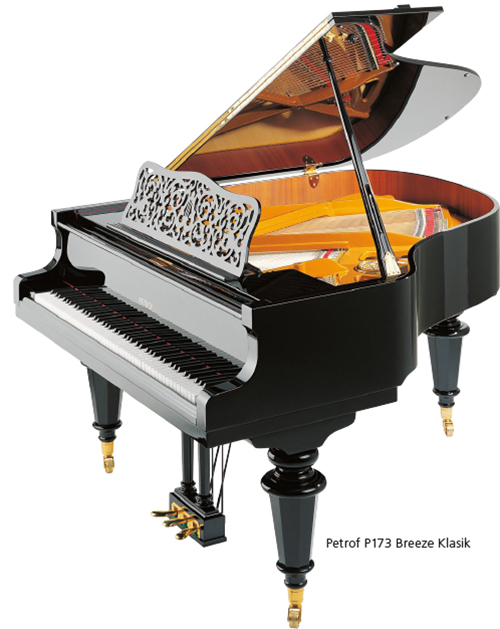 Petrof’s grand pianos are available with either the Petrof Original Action or a Renner action. The Breeze and Storm that I played featured the Petrof Original Action, the Bora a Renner action. I was told that, except for tuning, the pianos had not been prepped prior to my arrival; my remarks here are based on their condition directly from the factory. I found both actions delightfully sensitive, of medium weight, and remarkably well regulated. They allowed for excellent control in the quietest playing, yet responded with surprising sprightliness in fast passages and repeated notes, handling both with ease without overtiring me. I found that the Petrof Original Actions handled repeated notes slightly better than the Renner, and offered a modicum more control; however, pianists playing the most demanding repertoire will be happy with either. Given these findings, I believe that these pianos are well suited to a wide variety of repertoire. Their lengthy sustain and round tone allowed Classical melodies to sing without needing pedaling to combat dryness, while their resonance, and wide ranges of dynamics and color, created lush, full sonorities for Romantic and French Impressionist repertoire. I was particularly impressed with the Bora, which, despite being only 5′ 2″, had excellent dynamic range and was capable of great nuance; it would be an ideal practice piano even for pianists of the highest level. The two smaller instruments are probably best used in a home setting; either would be an excellent practice and teaching piano. The largest model, the Storm, with its bigger sound, could be used in large classrooms or small performance halls.